THE first Devon Open Series meeting of the season took place at Brickfields on Sunday. The event attracted athletes of all standards and ages from under-10s to veterans. The men’s 400m hurdles saw last year’s English Championship runner-up Matt Sumner take on European Masters medallist Neal Edwards. Summer eased to victory in his first run over the hurdles this season in 56.14 seconds, with over-45 veteran Edwards clocking 61.08. In the women’s 400m hurdles there was another good run by Plymouth’s under-20 athlete Molly Mather, who clocked 67.73. City of Plymouth’s Mali Heard enjoyed a good day by winning the under-13 100m, 150m and long jump and setting two new personal bests. She clocked 13.86 seconds for the 100m, 20.71 seconds for the 150m and leaped 4.37m in the long jump. Club colleague Leo Shipley continued his fine form by winning the under-17 100m in 11.87 seconds and the 200m in a PB time of 24.24. Tavistock’s Ben Pitts took victory in the under-15 boys’ 100m in 12.39 seconds and also wom the long jump with 5.58m. 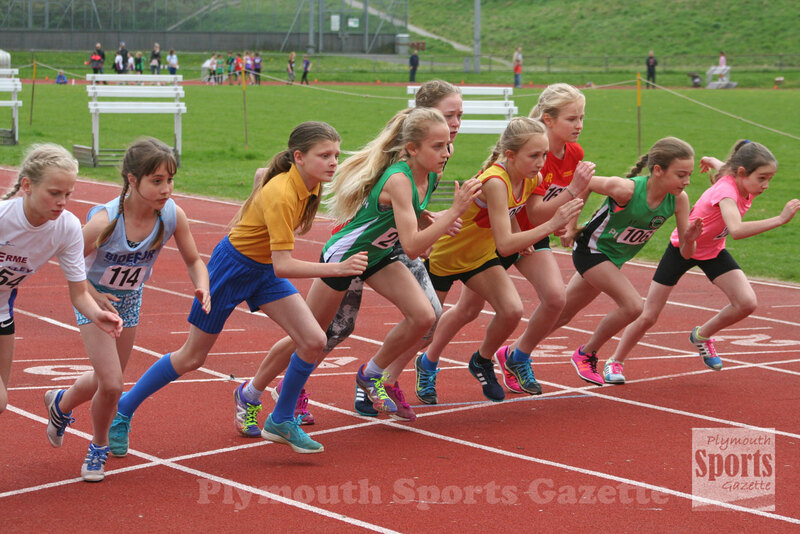 Plymouth’s Lili Fern took honours in the under-15 girls’ 100m in 13.69 seconds, despite running into a strong head wind. 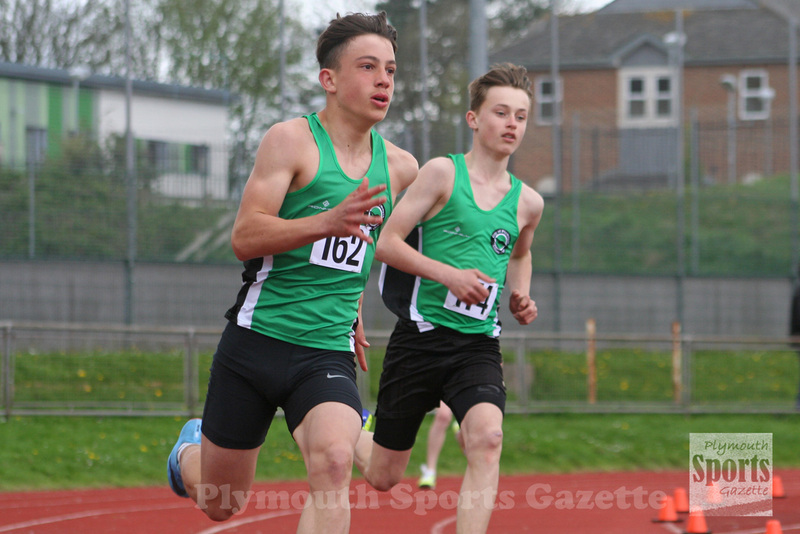 In the under-13 boys’ 150m Tavistock’s Rory Summers won in 21.78 seconds, while Tamar Trotters’ Connell Mc Carthy impressed in the under-15 boys’ 200m, winning in 25.85 seconds, while City of Plymouth’s Mia Mytton took victory in the girls’ under-15 200m in 28.31 seconds. In the 400m, Tavistock’s Emma Ryder set a new PB of 61.75 seconds to win the women’s race. Her team-mates Bradley Stevens and Ollie Woodmason were first in the under-17 and under-15 800m respectively in times of 2:15.59 and 2:18.35. Under-17 club colleague Tily McDowell was also first in the women’s 800m. 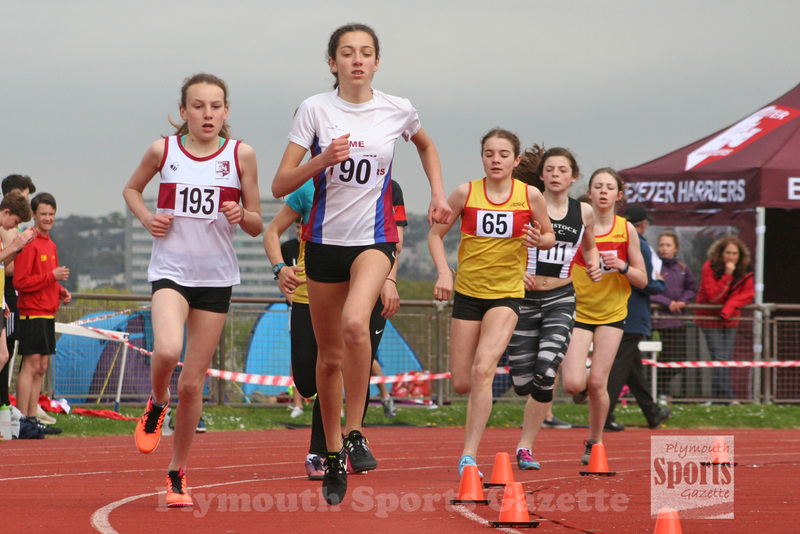 City of Plymouth’s Poppy Nortcott moved into the UK’s top 10 for the under-13 1,200m with an impressive 4:05.15 run. Team-mate Verity Tank also impressed over that distance by taking third in 4:16.85. Tavistock’s Sophie Main clocked 5:14.46 to win the under-15 1,500m, while under-20 team-mate Michael Barton was first in the men’s 1,500m in 4:46.46. Erme Valley teenager Joe Battershill clocked 9:49.9 to win the men’s 3,000m, ahead of veteran international Simon Anderson. In the throwing events, there was a good performance by Tavistock’s Edward Fileman to win the under-17 hammer in 44.81m. Club colleague Charlie Shipton was first under-20 with 38.39m, while City of Plymouth’s Kayleigh Weston set an impressive new PB of 38.97m to win the under-17 girls’ hammer. Tavistock’s Lois Fileman was second in the under-20 women’s discus with 26.31m. Erme Valley’s Paige Johnson won the under-15 shot with a new PB of 8.67m. Fellow Erme Valley athlete Ella Isaias set a season’s best and was just one centimetre of her PB in the high jump. She leaped 1.50m to finish second in a strong under-15 girls’ category, while Plymouth’s Erin Muldoon set a new PB of 1.45m to finish third. Estelle Hodges, of Erme Valley, won the under-17 girls’ long jump with 4.92m. Plymouth wheelchair athlete Doaa Shayea clocked 22.29 seconds for the 100m, 38.95 for the 200 and 73.44 seconds for the 400m. 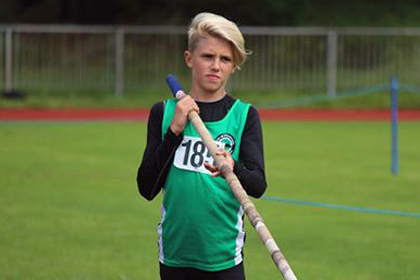 Meanwhile, City of Plymouth’s Noah Jones set a new pole vault PB at the Cornwall Open at Carn Brea. He leaped 2.90m, which puts him in the UK’s top 15, despite being in his first year at under-15 level. Jones is hoping to jump 3.05m in the next couple of months and qualify for the English Schools’ Track & Field Championships.